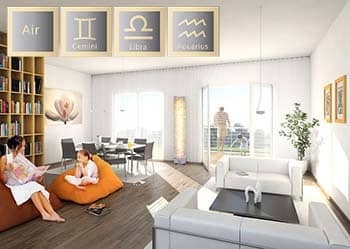 Astrology.Care - What Interior Design Do You Prefer? Air Zodiac Sign knows! Tan leather sofas, bohemian bedding, sheep skin rugs, transparent chairs, Moroccan rugs, waterfall chandeliers, white tables - what you like most and want to see it in your perfect interior design? French romantic interior or modern minimalistic lofts - what interior design style is apt to you, as a designer of your own dwelling? All people see their perfect design differently, so which one suits you? Read on, and you'll find out what interior design is the best for each Zodiac sign. Gemini: This is one of the most sociable signs in the Zodiac. They need to be surrounded by people. They have bright and vivid imagination, often supported by a witty tongue. They are in instant motion. Gemini loves to change the scenery and it concerns interior design as well. Though, they adapt not as good and fast as they want, but they never regret it, so they do it often. It may be manifested in moving of the furniture or replacement of the pictures on the wall, or reorganizing of the working space. It may be that today they prefer minimal decor, and tomorrow you can observe eclectic remodeling. Such fluency really matches their personality and lifestyle, as Gemini is always in trend, always fresh. They like to surprise with their decoration decisions, eccentric choices and unconventional approach to interior activities. They are 100% urban people. Due to their changeability, they may collect things, but some time after they will definitely get rid of all extra stuff, because Gemini needs space. Space is like a blank canvas for their creative self-expression. Modern art, unconventional furniture, designer's or hand-made collections, souvenirs, extraordinary color choice - everything is possible, when Gemini decides to redesign the house. Also, a great deal of gadgets and devices, especially to listen or create music. Music is very important for Gemini. Libra: Libra is ruled by Venus, so this sign has a great sense of beauty and aesthetics. They are the kings and queens of the hearth. Home is very important for them, as they believe it to be their castle, a place where they can return no matter what. So they always have quite detailed view of "perfect" interior. The main thing about interior design is definitely comfort. Libras build the home not for themselves, but for the people they love. The criteria for a perfect home are ability to relax, aesthetics of the house, comfort, lots of space and safety. Neutral shades, natural lighting, wood and marble in design, brass and silver elements, oversized furniture for extra comfort, natural fabrics, and elegant timeless style are the typical features of Libras house. Also, they prefer Oriental themes and flowers when it comes to decorating. Their home is quiet and minimalistic. The world they live in might be chaotic, but their home should be balanced and relaxed. However, due to their indecisiveness, they tend to hesitate whether they need these things in house or not. It leads to clutter and excessive storing, though by nature they like lots of space. Aquarius: Aquarius is very intelligent and sensitive sign. They tend to analyze everything that happens to them and make a very deliberate decision, which concerns design and details in the house as well. They need to have their own space, home, because they tend to be independent and try to rely only on themselves. That's why they need their own space, tidy and organized. They are really concerned about the safety and cleanness of their houses. Also, their signature is a mixing of everything: of clothing style, interior elements, skills and interests. Aquarius takes few details that no one else would pair and the result is very interesting and sophisticated. They love to bring guests to the house, because they always have whet to show and what to boast with. People in the house of Aquarius will definitely feel like home there. Their ability to design and blend styles is simply amazing. Their blend of modern and traditional style is so natural and neutral that it is a pleasure to just be in such atmosphere. Their love to meaningful details is the zest of their design. The best colors for them are the shades of blue, purple and green, though they can make it brilliant from any color. What Interior Design Do You Prefer? Water Zodiac Sign knows! 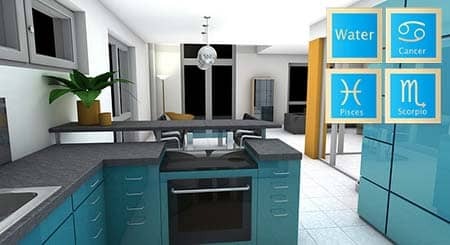 Read this article, and you'll find out what interior design is the best for Water Zodiac sign. For example, Denim, sea greens, blues, emerald are the right hues for the Cancers dwelling. Scorpions prefer dark tinctures for their walls and furniture. What Interior Design Do You Prefer? Fire Zodiac Sign knows! 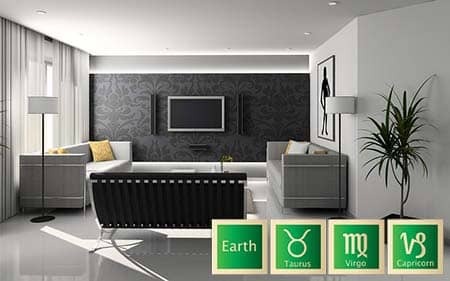 Read this article, and you'll find out what interior design is the best for Fire Zodiac sign. For example, Aries mostly prefer minimalistic design, so it looks tidy and there are no odd things to collect the fug. Leos like everything soft: pillows, blankets, toys, beanbags, carpets. What Interior Design Do You Prefer? Earth Zodiac Sign knows! 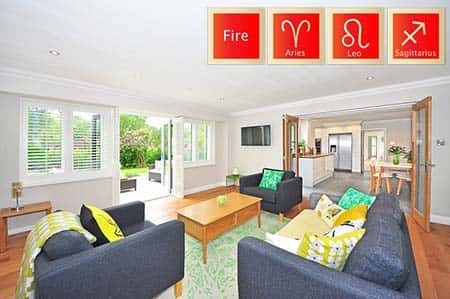 Read this article, and you'll find out what interior design is the best for Fire Zodiac sign. For example, If you want to please a Taurus - provide a place with comfortable and luxurious design. Virgos are keen on details, and they are the real professionals of small things.